When former state District Judge Rodolfo “Rudy” Delgado announced his retirement and resignation last week, he didn’t address one of the elephants in the room: whether he’ll run for a seat on a state appellate court. His wife and campaign treasurer, Diana Delgado, confirmed Wednesday that her husband’s name was still on the November general election ballot as the Democratic candidate for the Place 4 seat on the 13th Court of Appeals. “He’s got to look into what his resignation means as far as that’s concerned,” she said, adding that he was conferring with his attorney and a state commission. Regardless of whether Delgado decides to withdraw from the election and remove his name from the ballot, the Texas Democratic Party is unlikely able to nominate a candidate to replace him. Federal investigators allege Delgado, 65, accepted three bribes totaling approximately $6,000 from a local attorney between November 2016 and January of this year in exchange for releasing clients on bond. A week before the March primary election, a federal grand jury indicted him on three counts of federal program bribery and as many counts of violating the Travel Act for allegedly brokering the bribes over the phone — charges which Delgado denies. “Unquestionably we do not want to have a candidate who is under indictment on the ballot … We do not find this to be a good thing, and we would prefer that he withdraw — if he can legally — his candidacy for the 13th Court of Appeals,” State Democratic party chair Gilberto Hinojosa said, noting that he has communicated these sentiments to Delgado. While the former judge could withdraw his candidacy at any time, the question for Democrats is under what circumstances they could nominate a replacement candidate to take Delgado’s spot on November’s ballot. The Texas Election Code only allows for a political party to nominate a replacement if their candidate withdraws due to a “catastrophic illness” that would prevent him or her “from performing the duties of the office sought;” if the candidate withdraws because she or he becomes a nominee or appointee for another elective office; if the candidate is declared ineligible to run for office due to a state or federal felony conviction; or if the candidate dies — all of which must occur 74 days prior to the election. Federal indictments don’t prohibit a candidate from running for office, according to the election code, and Delgado is not the only candidate under federal indictment on November’s ballot. Hinojosa pointed to Texas Attorney General Ken Paxton, the incumbent Republican candidate, being under indictment since 2015 on state securities fraud charges. The Republican Party of Texas has “never taken a position that it’s inappropriate to have a candidate under indictment” continue seeking office, Hinojosa said. Delgado is tentatively scheduled to go to trial in a Houston federal court Sept. 10, but it is highly likely the trial will be pushed back. There are “voluminous documents and records” of evidence, according to a motion for continuance Delgado’s attorney filed last month, which also noted that a “superseding indictment” against Delgado may be pending, which could include new charges. Even if the trial does take place before November and he was convicted, the conviction wouldn’t be final until he had exhausted the appeals process, according to the election code. Were Delgado to be elected in November while still under indictment, he could decline the office, which would leave a vacancy on the appellate court. A vacancy would also open if Delgado wins and takes the oath of office, only to later be convicted of the charges. The vacancy would be filled by the governor, who would likely appoint a Republican justice to fill the Place 4 spot on the 13th Court of Appeals until voters would elect a candidate — appointed by each party — during the November 2020 general election to fill the remainder of Delgado’s four-year term. Delgado’s Republican opponent, Mission-based attorney and former district judge Jaime Tijerina, said the indictment has not changed his campaign strategy. Tijerina, who has traveled to all 20 counties in the 13th Court of Appeals’ large South Texas jurisdiction, said he plans to return to each of the counties once campaigning ramps up as the election draws near. 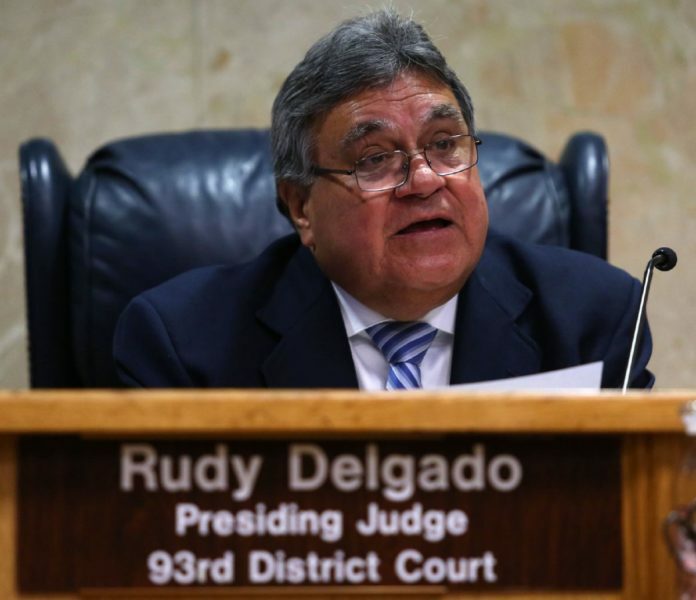 Such travel could be difficult for Delgado, who must request permission from the Houston division of the U.S. District Court for the Southern District of Texas to travel outside of Hidalgo County. “I don’t want to be the only Republican on the court. So I am going to go out and campaign as hard as I possibly can regardless of the circumstances that are in my race,” Tijerina said.